I admit I found this chapter abstract and confusing. I think the point is to consider the use and source of money used in working towards your goal. You should invest in efforts that will see a consistent return, both in money and as enhanced soil fertility. For example, if you continue to use conventional agricultural methods which effectively mine soil fertility, then you are investing in agrichemicals which are not sustainable and not creating soil fertility, so you are not really building wealth and resources that you can build on. I think that's what it means anyway! Fire is a powerful tool for modifying our environment. Savory suggests that overuse of fire and rest is leading to desertification in brittle environments, which is a reminder that fire should be used very carefully. One of the arguments for the use of fire is that many of the Australian plants are fire-resistant and have therefore evolved to withstand frequents, however this ignores the fact that once abundant fire-sensitive plants are now extinct due to the use of fire by ancient aboriginal people. Overall, fire is detrimental to all four ecosystem processes in the long term. Experience has shown that fire alone does not improve grassland/pasture in brittle landscapes. It could be a tool used as part of a management process, but other tools may produce better results. Unfortunately many farmers in our area rely on burning as their only pasture management tool (the photo above is our neighbour's pasture burning). Either in the form of total rest (all livestock removed) or partial rest (extensive livestock operations where animals are spread out over large areas), if not used appropriate this tool can also cause damage. Often we allow damaged land to rest in order to recover, however this may not actually help in brittle landscapes. Old plant material decays very slowly due to lack of moisture, which can cause grasses to die out. Rest tolerant plants are often unproductive and unpalatable. Animal impact is actually needed in these situations to break down plant material (in the rumen of livestock) where it would naturally decay in less brittle (wetter) landscapes. The effect of rest depends on the degree of brittleness. Where we live, the landscape moves along the brittleness scale from year to year. Sometimes we have high rainfall and resting a paddock will result in lush, thick grass cover. Other years if we have very low rainfall for several months, that same paddock will be full of unproductive, sparse clumps of dead grass. Knowing how much rest is needed under certain conditions before it becomes detrimental and reducing the occurrence of "partial rest" by keeping paddocks small (i.e. rotational grazing methods) is important in brittle landscapes. One of the best ways to rejuvinate an over-rested area is to bring cattle in for a short period, confined to small areas with portable panels or electric fence and feed hay bales, manure and hay will get trampled into the dead grass and help to kick-start a productive decay cycle. 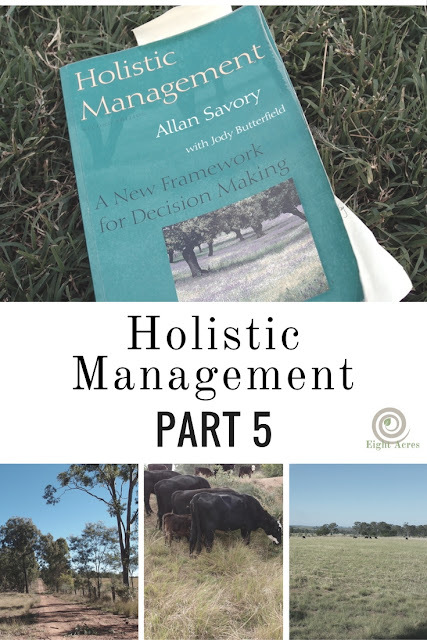 This mirrors the herding and moving on behaviour of large ruminants in nature which have maintained productive grasslands over centuries, and the basis of mob-stocking (Joel Salatin) and other rotational grazing concepts. Savory also notes that the condition of rested land is an indication of the brittleness of the landscape. I know we have a lot of bare patches on partially rested areas of our property, which confirms my assessment that we are usually very brittle. By manipulating the timing and intensity of grazing we can use it to our benefit rather than causing damage. Grazimg must be considered in conjunction with animal impact, the next section. In this case, grazing itself refers to the eating of grasses and other types of vegetation, even through bushes and forbes are technically "browsed" rather than grazed. The point at which grazing becomes "overgrazing" depends on weather the vegetation is annual or perennial, grass or non-grass and the type of grazing animal. While short-lived annual plants are never really overgrazed (as they die off each season anyway), perennial grasses, which are so important for soil cover in brittle environments, are susceptible to overgrazing. Grasses have growth points close to the ground and actually benefit from having old growth removed by grazing, either early in the growing season or when the plant is dormant. However, if the grass is grazed too frequently in the growing season it will fail to recover. As I wrote in a post back here (actually just after I had first learnt about holistic management), the grass has to use energy from its roots to regrow each time and will gradually lose root-mass if it is grazed repeatedly before it can recover. Therefore, overgrazing is defined as " any grazing that takes place on leaves growing from stored energy at the expense of roots, rather than directly from sunlight". By contrast, "grazing" as a tool is the appropriate use of animals to eat grass and other plants, to the benefit of those plants, without overgrazing. Slashing or mowing can be used instead of grazing (as per Peter Andrews). Grasses with runners, such as Rhodes grass and Blue grass are less likely to be overgrazed than bunching grasses such as Panic and Digit grass. This is because the running grasses spread horizontally, so less leaf is removed per root mass. Grazing can be used to improve diversity of plants, encourages vigorous growth and reduces fire hazard as old dead growth doesn't accumulate. Water and mineral cycles are enhanced through greater root mass. Overgrazing tends to have the opposite effect. In an extensive grazing system (large area with few animals) some plants can be overgrazed and others over-rested in the same paddock, as animals return to the same plants to nibble the tasty regrowth. Therefore it is the time that the animals have access to an area and not the number of animals that is important (as discussed in part 2: four key insights). This is where the ideas of rotational grazing or Joel Salatin's "mob-stocking" are useful, as you can mimic the effect of large herds, bunched together by predators and moving regularly to new pastures. Our property was overgrazed when we had too many animals during drought conditions a couple of years ago (cattle prices were really low, so we held them a bit too long which we waited for the market to settle and then sold all of them). We were lucky to have rain since then and with no animals on the land and non-brittle conditions, the rest allowed the grasses to regrow. Now we risk over-resting because we only have fewer cattle on the property. It seems that we need to vary stocking rates depending on the year. We also need to set up rotational grazing, we are working on making smaller paddocks and thinking about how we split them up using electric fencing. The one problem I have with rotational grazing is that all the examples I have are from non-brittle environments. 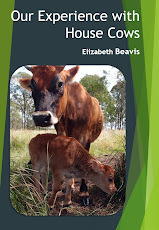 Joel Salatin, my favourite house cow blog "Throwback at Trapper Creek" and even fellow Australians Peter Andrews and Darren Doherty, are all using this system in less brittle environments. But we will come to this later in the book. Animal impact refers to everything else that animals do apart from grazing - dunging, urinating, salivating, rubbing, and trampling. This tool fits nicely with permaculture principles, considering how we can let nature (specifically farm animals) replace machinery or chemicals to remove overgrown vegetation, fertilise and disturb and shape compacted land to improve the land. The idea that cattle (and other stock) might actually help the land was also covered in more detail in the book Can cows save the planet? Certainly the way that cattle are fed intensively in feedlots is NOT contributing to saving the planet, but cattle in a well-designed and managed rotational grazing system will improve the land. In fact, in a brittle environment, where there is not enough humidity to sustain microbial breakdown of plant material, ruminants (cattle, sheep, goats etc) are essential for cycling nutrients in the environment. While the previous two tools used living organisms, this is also a separate tool to encourage the consideration of biological solutions before technology. Again, this fits with permaculture principles. "Failure to think along these lines accounts for much of the environmental damage humans have wrought". This tool is closely linked to the ecosystem process of community dynamics, i.e. if you develop community dynamics through biodiversity, you will have the tool of living organisms to use, and if you use the tool you will develop the ecosystem process further. This is the oldest tool, the most complex, and the one that has been too often abandoned in favour of technology, to the detriment of all the ecosystem processes. When we raise animals or crops for our own advantage, we forget that they exist within an ecosystem, and rely on technology to control predators, pests, competitors, and disease, instead of working with the entire system. That is a very brief overview of the tools in holistic management. The next section is about testing decisions, how we decide which tools to use to work towards our holistic goal. This is where we will really get into the specific methods that we will use on our property. What do you think? Do you use these tools effectively? Nice overview. I would hazard a guess, by your description, Savory warns people not to waste labour and money, on lost causes. Often we see money and labour as the solution to all problems. But not if we don't review the return rate, and make amendments where it's no longer profitable. The permaculturalist in me, sees Money and Labour, crossing over into Technology. As barrels of oil, can be equated into labour and money too. I'd be interested to know if making biochar was mentioned in the section about Fire? Instead of having to burn the soil and kill all the micro-organisms in it, the fire is contained to one pit, where you make the biocar. Then that biochar gets spread around the property, to provide more minerals for the soil. If Fire has any benefit to the environment, it's in making biochar available to the soil, increasing mineral diversity. But in brittle environments you don't want large fires traversing the landscape. It provides no ecological benefit to the system for all it's fury. I like the concepts behind rest, as it makes sense to cover the soil with something, even when grass is not growing. Although the permaculturalist in me says, you want to grow your own feed, rather than buy an input in. I've read some interesting things to do with Leucaena trees being used as fodder crops, where it's difficult to grow pasture, either through too much water or not enough. By growing desert like trees (I think she-oak is a traditional one used in the past too) you just grow in alleys on contour, and cut down what the cattle need. I've heard old-man salt-bush is a good fodder food also. Hardy too, made to survive desert conditions. Dealing with growing your own fodder plants in windrows/hedgerows, would also deal with Living Organisms and Technology. The petroleum required, human labour and money, would be slashed substantially. But it does take some human creativity to get those fodder crops producing. Like what crops grow best in the area, and how to keep cattle off them while they're establishing. 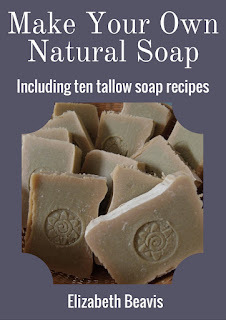 How Savoury spells it all out, is important for people who don't have the time or inclination to understand permaculture. Because I don't think permaculture works as quickly at applying solutions, as what Savoy's approach can. It doesn't require you to join the dots to see where things cross over, in order to find your solution. It allows you to tackle areas as you feel you can instead. This book has been on my wish list for some time now. Something else always seems to take financial priority, however. Your series of reviews are an excellent tool for evaluating to worth of the book. Well done Liz.